It was hurricane season and people on the island were freaking out. Despite the island residing below the hurricane belt, getting hit wasn’t unheard of, and it was being predicted that the coming hurricane was about to hit my home. I was born and raised on the small and obscure Caribbean island of Curaçao. One thing this island has going for it is the infrequency of hurricanes directly making contact. But even then, they do tend to scrape by, bringing with them too much rain for the infrastructure to handle, causing floods. Only once in my lifetime did people really take a coming threat very seriously. I don’t remember the hurricane’s name or its category, but every prediction showed that we were gonna get hit hard. A good friend of my brother’s was gonna be alone in his house the entire time, since his father was away on business. So we invited him to come stay over. He brought an Xbox with him. I say “an Xbox” because it wasn’t really his, someone else had him hold on to it while they were out of the country. He also had with him a copy of Halo: Combat Evolved, but getting to actually play it wasn’t as simple as just popping it in. The Xbox wasn’t completely broken, but it did need repairs. We would put the disc in, and if the Xbox made a specific noise, then we know it’s working, otherwise you try again. Sometimes we would see the loading screens go backwards as the Xbox struggled to read the disc. But once we got it working, I was hooked. We’d play a little multiplayer on the Blood Gulch map, trying to do things like get the warthog and the tank up onto one of the bases. We’d rotate playing the co-op mode between the three of us and we loved the game’s story. All the while, my mom was going to the grocery store to pick up cases full of water bottles, and taping up the glass windows and doors. We’d be playing, having a ball, “I’m gonna jump into that Bansh- goddamnit, the game crashed again.” The Xbox’ hard drive had a music album on it. “Mother Earth” by Dutch band “Within Temptation”. Pretty great album, but it was playing on a loop, sometimes for almost an hour, while I kept re-inserting the disc and pressing my ear against the Xbox to hear if it’s working. Once it was working I would call everyone back over. “Huh? What hurricane?” We were enjoying ourselves so much that we had completely forgotten about it. There was a moderate amount of rain but in the end it turned out to be a crock. It missed, but we saw some footage of it. You could see it barreling it’s way past us and going north from the northern end of the island. I don’t know what we ended up doing with all that water. I guess we took it to a beach. Regardless, that’s how I discovered the Halo series. We played until it was about 4am and then we hit the sack. One day my brother and his friend finally had enough and decided to try and fix the Xbox. They succeeded and we’ve been Halo fans every since. Apparently we weren’t the only ones. On the day Halo 2 launched, my brother and his friend went to the usual shop that sold video games in town and encountered quite a sizable crowd. This was all during Halo-mania but this is still highly unusual for this small island. People were standing outside because the games hadn’t arrived yet. The owner of the store kept coming out and assuring his would-be customers that they’ll be here any moment. Eventually a man came around the corner and was walking towards the store with a big box. Everyone knew that had to be the guy. They opened it up and started selling copies right out of the box. My brother brought it home and we played through the campaign in co-op mode. 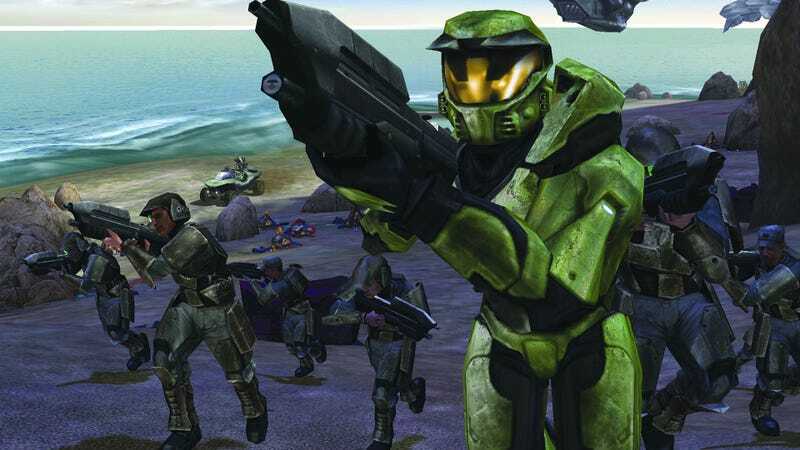 Ever since then, we would buy every new halo game that released and played through it in co-op mode. This tradition was eventually broken with the release of Halo 5: Guardians. 343 industries decided that the game would be more enjoyable if it was constantly changing resolutions to maintain 60 frames per second. I maintain that whoever came to this conclusion is a fool. They could also use a better marketing department.